Save this to something like test.thrift. 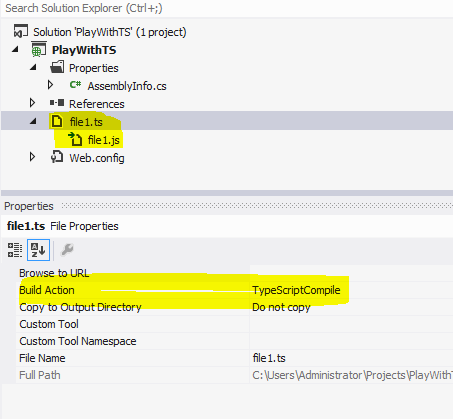 IDL file can also have service(RPC) definitions, enums, namespaces and constants. You can use inheritance and include other thrift files. Result will be in gen_csharp folder. I should say result is ugly, but a bit later on this. Now it is time to start serving stuff to the wire! Unexpected token in input: "∩"
It looks like this means that you have unsupported encoding for thrift file. Change it to something without signature fixes the problem. Generated code is awful, strange naming conventions, strange base classes. Lack of correct capitalization. And T prefix – it probably means Thrift, but for me it reminds Delphi. Async code is generated only under SILVERLIGT symbol. There is no love at first sight. Usability is quite good, but implementation kills the whole idea. I will try to find better implementations for my needs. Next is probably protobuf. Please note, Apache Thrift project permanently moves all things around. So many links to tutorials, readmes repositories may not be available at the time of reading. Ping me with any problem, I will update post. From time to time you need VM to play and forget. It would be cool to have something like Vagrant, але маємо те, що маємо. So here few links when you can get preinstalled virtual machines with Windows. One of the best sources of virtual machines up to date is Modern.IE site. Technically this VMs are intended to test Internet Explorer, but I hope you will be able to accept and live with this. Virtual Machines are packed for almost any virtualization platform such VirtualBox, VMWare and Hyper-V. You can find all desktop versions: Windows XP, Windows Vista, Windows 7 and of course Windows 8. All VMs are trial for 30 days and you can reset this 2 times, so 90 days of usage. For Windows Server 2012 go to trial page and download Evaluation VHD. This is 180 days trial. Obviously works in Hyper-V but also works well with Virtual Box (ensure that you have last Virtual Box, there were bug with VHD based images). Windows Server 2008 R2 trial VHD – could be downloaded here. Should also work in Virtual Box. I am playing with Azure last months. I love Azure. Really breath of fresh air last days… But there is small funny issue… Client libraries are async. But async is implement with old IAsyncResult model. Uuuu. Ugly. Let’s fix this. Few months ago I became SherePoint developer, and this is like developing in damn stone age. No async, no SignalR, no .. , actually there almost nothing from last years. Mad. If you need something post 2008, you are out of lack. But this is like 8-bit game. You know this feeling of playing games on ZX-Spectrum? So let’s play. Obviously, you need install TypeScript. It will ask restart everything, I also restarted few servers, just in case. Create new TS file (for example in Layouts folder), you need to use Add New Item dialog, because otherwise VisualStudio will not assign (and will not allow you) TypeScriptCompile to Build Action property of the file. Try compile another time. This time it should work. Somehow I need remove TS files from result WSP file. I need better way to manage TypeScript definition files in solution, but this is general problem of how integrate NuGet content packages to SharePoint project. Almost all developers do mistakes listed bellow and I cannot blame them, everybody should learn new stuff.